The San Francisco 49ers visit the Philadelphia Eagles in Week 8 of the 2017 NFL season. PFF previews the top player matchups of the game. QB C.J. Beathard vs. pressure — Beathard’s 46.7 overall grade after just shy of two games of action would be the league’s second-worst if he had enough snaps to qualify, topping only DeShone Kizer, and the third-round rookie has struggled in a number of areas. Chief among those has been his play under pressure, where Beathard is the only quarterback with at least 30 dropbacks under pressure to average less than 4.00 yards per attempt, a mark he clears by more than a full yard (2.96). On Sunday, he’ll be facing an Eagles defense that has pressured opposing quarterbacks on 38.8 percent of snaps this season, the fourth-best rate in the NFL. If that weren’t enough, Philadelphia brings that pressure quicker than all but two defenses — 29.3 percent of their pressures reach the quarterback in 2.0 seconds or less. Right side of 49ers OL vs. Edge Brandon Graham and DI Fletcher Cox — Complicating matters further, the 49ers may be without both starters on the right side of their offensive line after Trent Brown and Brandon Fusco left last week’s game against the Cowboys with injuries. 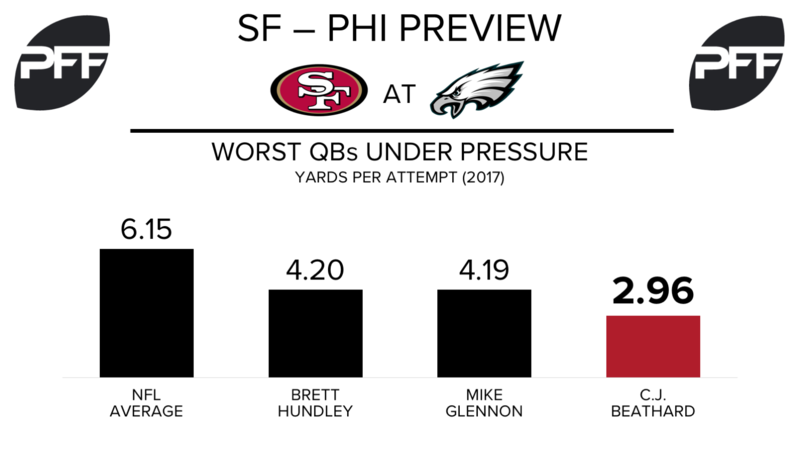 Should neither player be available in Philadelphia, San Francisco will likely be inserting Zane Beadles (RG) and Garry Gilliam (RT) into the starting lineup, who have combined to allow eight total pressures on 72 pass-block snaps this season. That could spell potential disaster against one of the best defensive lines in football, particularly on the left side where Graham and Cox spend the majority of their time. Graham is one of just seven edge defenders with an overall grade of 90.0 or higher (90.2), and his 90.1 pass-rush grade trails only Melvin Ingram. Cox’s pass-rushing prowess hasn’t been far behind, with his 86.1 pass-rush grade ranking fourth among interior defenders. RB Carlos Hyde vs. Eagles front seven — After losing significant snaps to Matt Breida in Indianapolis three weeks ago, Hyde has responded with his two best games of the season, earning 78.7 and 77.6 overall grades against Washington and Dallas, respectively. During that span, Hyde has forced 10 missed tackles, or one every 3.6 touches — over the first five weeks of the season, he was forcing a missed tackle once every 6.5 touches (14 total). He’ll face an Eagles defensive front that has been better against the zone runs San Francisco predominantly uses. Against zone runs, Philadelphia has allowed 3.23 yards per attempt (sixth) and 0.83 yards per attempt before contact (seventh). Against all other runs (excluding QB kneels, sneaks and scrambles), those figures increase to 3.97 yards per attempt (12th) and 1.53 yards per attempt before contact (13th). QB Carson Wentz vs. 49ers pass rush – Philadelphia’s sophomore quarterback placed himself in the MVP conversation after Monday’s victory over the Redskins. Wentz’s 86.5 game grade was the highest at his position in Week 7. He connected on 16-of-22 attempts without pressure for 259 yards and three touchdowns, earning a 132.4 passer rating on throws from a clean pocket. This season, it has been a different story when facing pressure for the young signal-caller. Wentz ranks 21st among quarterbacks with a 64.7 passer rating under pressure and dead last with a 45.8 adjusted completion percentage. San Francisco’s pass-rush will be key in throwing Wentz off his game. DeForest Buckner leads his team with a 10.7 pass-rush productivity, a mark that ranks him fifth among interior defenders. T Halapoulivaati Vaitai vs. 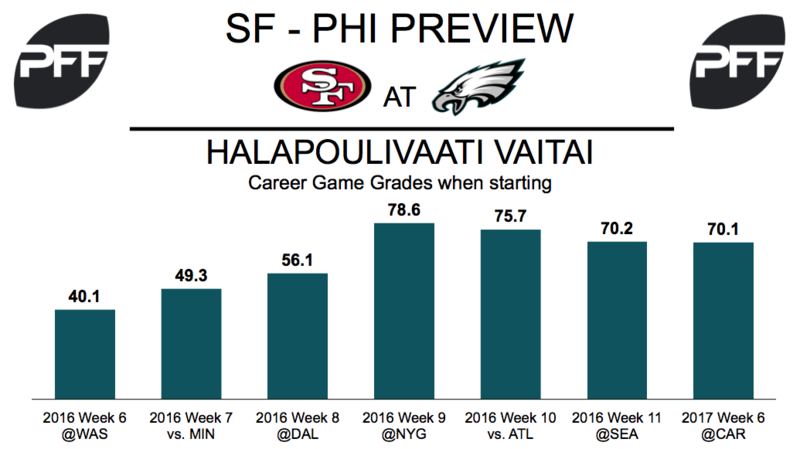 Edge Solomon Thomas – With veteran left tackle Jason Peters out for the year, Vaitai’s pass protection will be linked to his quarterback’s overall success. The sophomore has earned a poor 46.1 overall grade in 2017, and took over for Peters on the left side after he was carted off. Against Washington, Vaitai did not allow a pressure on 13 pass-block snaps. On the opposite side of the trenches, Solomon Thomas has endured an inconsistent start to his career. The rookie has just 14 total pressures in 190 pass-rush snaps, giving him a 5.8 pass-rush productivity mark. This mark ranks 58th among edge defenders. TE Zach Ertz vs. S Jaquiski Tartt – Ertz has yet to cool down in 2017, proving to be the most dangerous offensive weapon on his team. Last week, the tight end hauled in all five of his targets for 89 yards and a touchdown. Wentz had a perfect 158.3 passer rating when targeting him. Ertz also ranks second among tight ends with 2.23 yards per route run this season. Jaquiski Tartt will be tasked with slowing down the former Stanford Cardinal this week. The safety has averaged 0.57 yards per coverage snap (36th out of 58 safeties), while earning an 87.7 coverage grade in 2017 (eighth highest).